Each year, Microsoft seeks Australia's most innovative teachers. They come from every state and territory and have one thing in common - they're all using simple technologies in innovative ways to engage students and take learning to new heights! My entry into the 2010 Microsoft Innovative Teachers Award was based around the design and development of eNotebooks. My students and I have been creating digitally rich electronic notebooks since 2008.
eNotebooks ensure that students are stimulated, motivated and inspired, by providing meaningful resources, authentic experiences and exciting interactive opportunities. They also provide an alternative to heavy textbooks and save time and resources at the photocopier! In a world where technoliterate students challenge educators to accommodate for their learning needs in imaginative ways, eNotebooks provide an ideal platform to present attractive, entertaining and informative units of work. 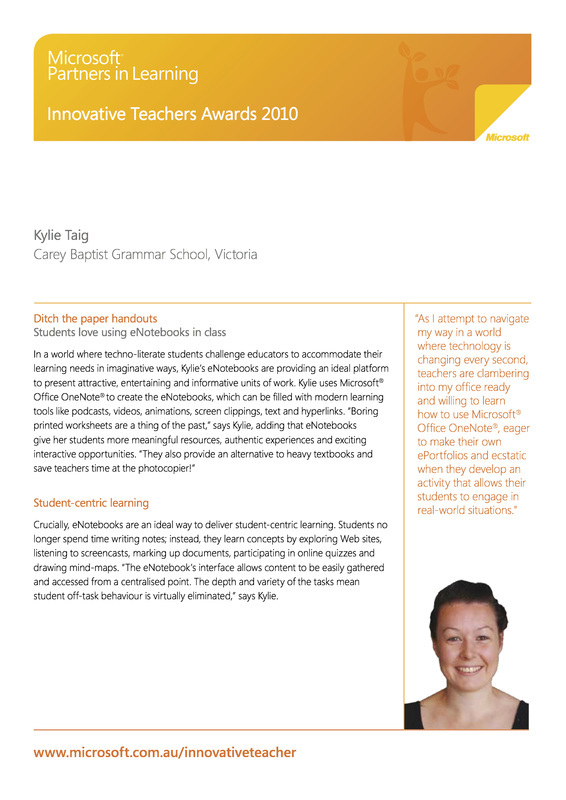 Teaching and learning with Microsoft OneNote has allowed me to create digitally rich electronic ‘Notebooks’. I have challenged the conventional use of OneNote and have pushed the tool well beyond its boundaries and limitations. eNotebooks allow me to present a balanced, flexible curriculum which fosters independence in learning and allows students to interact on a global scale. Multimedia (podcasts, videos, flash, screen clippings, digital writing and hyperlinks) are all embedded into a single eNotebook and are easily accessible to students and its flexibility and adaptability support a range of learning styles. Boring printed worksheets are a thing of the past, as eNotebooks provide a new world of learning and their dynamic, interactive capabilities allow me to focus on difficult notions, while still producing ample resources and simple examples. The use of eNotebooks within digital classrooms allows for student-centered learning and a more focused approach to class discussions. I am able to move readily from resource to resource and can easily capture student responses in a range of formats. Students no longer spend time writing notes, instead they learn concepts by; being directed to websites, listening to teacher made screencasts, marking up a pdf, participating in online quizzes and drawing mind-maps. The eNotebook’s interface allows content to be easily gathered and accessed from a centralised point. The depth and variety of the tasks mean student off-task behaviour is virtually eliminated. Student organisation improves as the eNotebook aids in structuring their notes, research and responses. The multi-user environment enables students to collaborate and share their opinions and ideas quickly and effectively. Class notes and extra explanations are also readily available for students to support their leaning and/or compensate if a class is missed. All of these resources are available for students to pursue at their own leisure long after they have left the class room, providing a world of opportunity where students can learn regardless of their location. Want to find out more about eNotebooks?? All State and Territory Microsoft Innovative Teachers will journey to Phuket, Thailand in early March to compete for the National title. During the 7th Asia Pacific Regional Innovative Education Forum teachers will be required to present their projects in the form of a poster. Click here to find out how the poster making process has gone!